Balconies can often seem like an architectural afterthought. They are usually pretty utilitarian: a wood or concrete floor, and a metal railing. Not really the outdoor living area of your dreams. Upgrading the balcony flooring can be the first step in transforming your space into a real oasis where you enjoy spending time. Before you add all the furniture, accessories and design elements to your balcony, you need to start with the floor. Flooring plays a really important role in defining the style of a balcony. A cracked concrete slab or splintery wood decking doesn’t really set the Zen vibe you were hoping for, does it? Today, I’m sharing some products and ideas that will get your balcony design headed in the right direction. 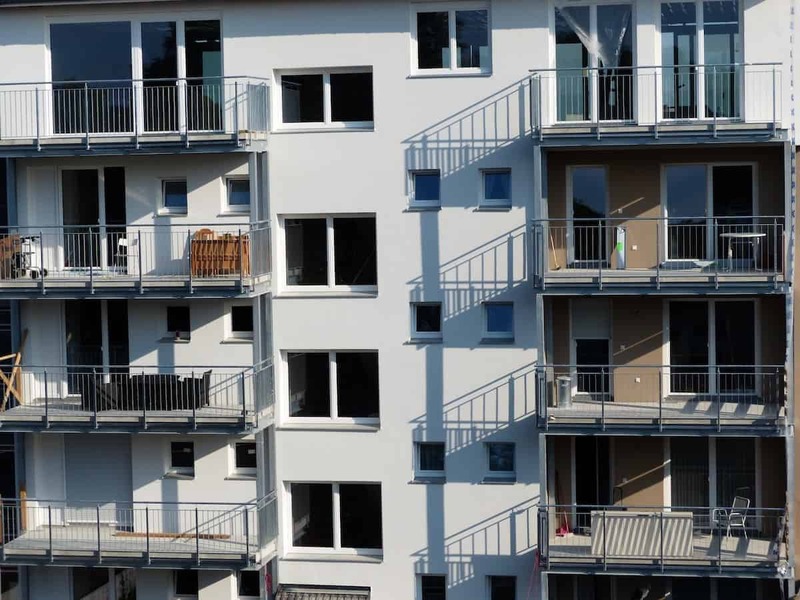 Obviously, if your balcony is in poor structural condition then it needs to be replaced. But, if it’s structurally sound and just plain or ugly, then you have a few options. These ideas are also good if you can’t physically alter your balcony, but want to make it look nicer. 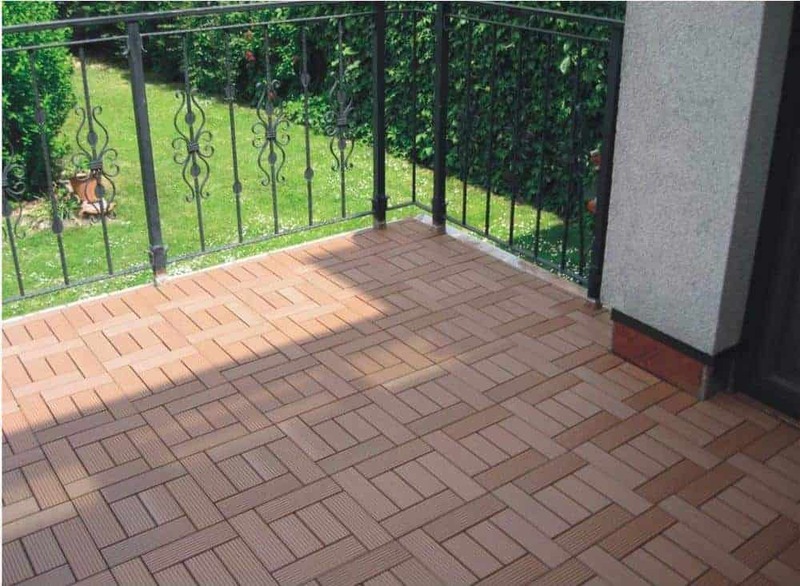 Decking tiles are a great choice for a balcony, especially one that looks bad. Instead of building an entire new floor, these tiles are placed on top of the existing surface. It looks like wood decking, brick, or even grass, on the top side, but has a plastic grid on the underside. This grid connects the tiles together to form a new floor. 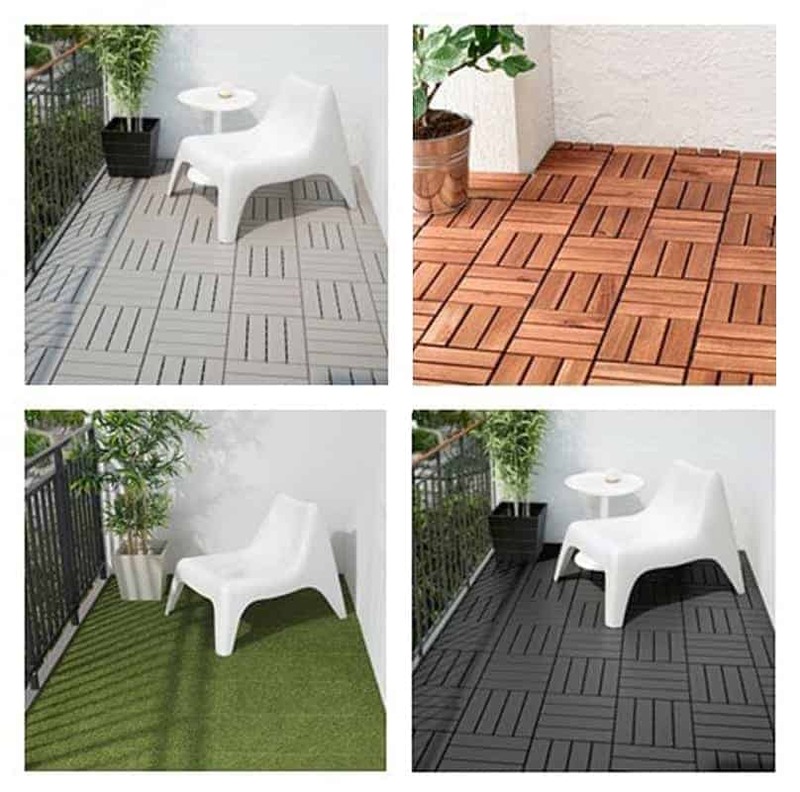 Runnen Floor Decking Tiles – Available in four options: a solid wood (made from acacia), dark grey polypropylene, light grey polypropylene, and a fake grass. The tiles are 11.75″ x 11.75″, and cover 8.72 s.f. per box. The dark and light grey tiles would be great for a more modern balcony design. The wood tiles are arranged in a parquet pattern, so you don’t have as many options in your layout as you would with the grey tiles. Also, be aware that you only get nine pieces in a box, so you’ll need more boxes for your project. 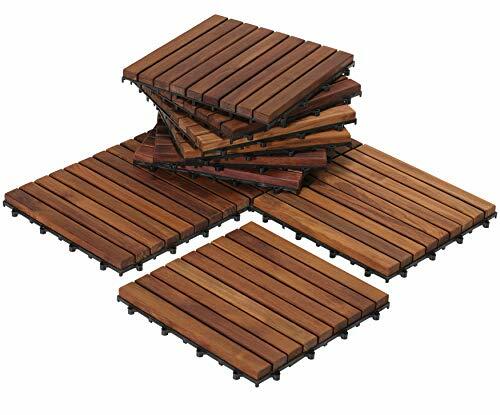 Bare Decor EZ-Floor Decking Tiles – While more expensive than Ikea’s tile, they are made of solid teak. As long as it’s maintained, solid teak will last a really long time. One box contains ten 12″ x 12″ tiles, that will cover 10 square feet. This option would be a good choice if you plan on having your balcony a long time. Of course, you can always pick it up and move it to a new balcony. 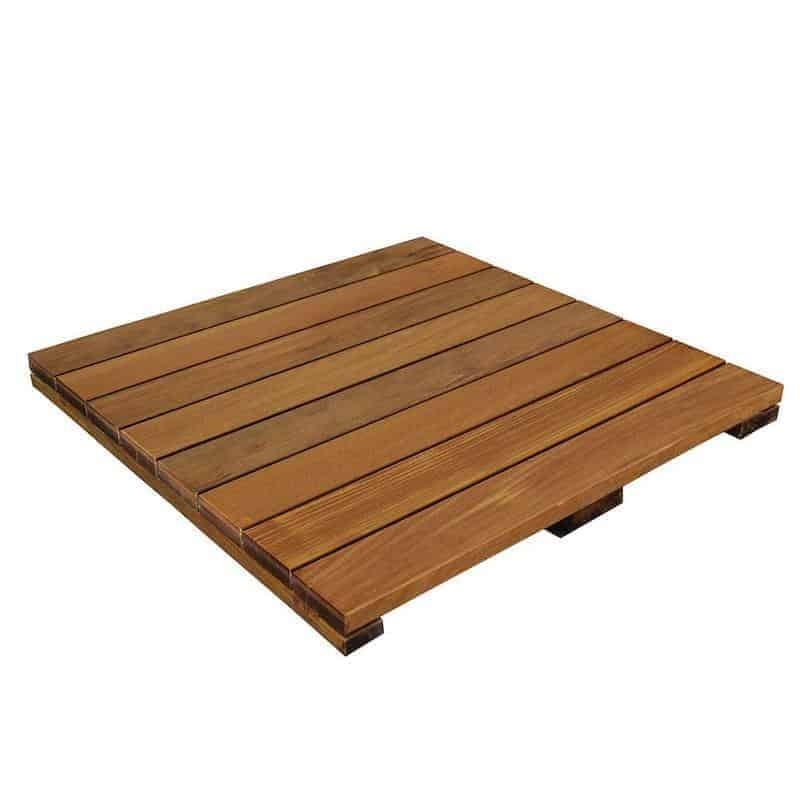 DeckWise WiseTile – Made from solid hardwood (Ipe), these tiles do not have the plastic support/connection grid like the other tiles. Instead, hardwood runners support the slats. Tiles are sold individually, rather than by the box. The tiles come in a larger size (2’x2′), and the individual slats are larger. 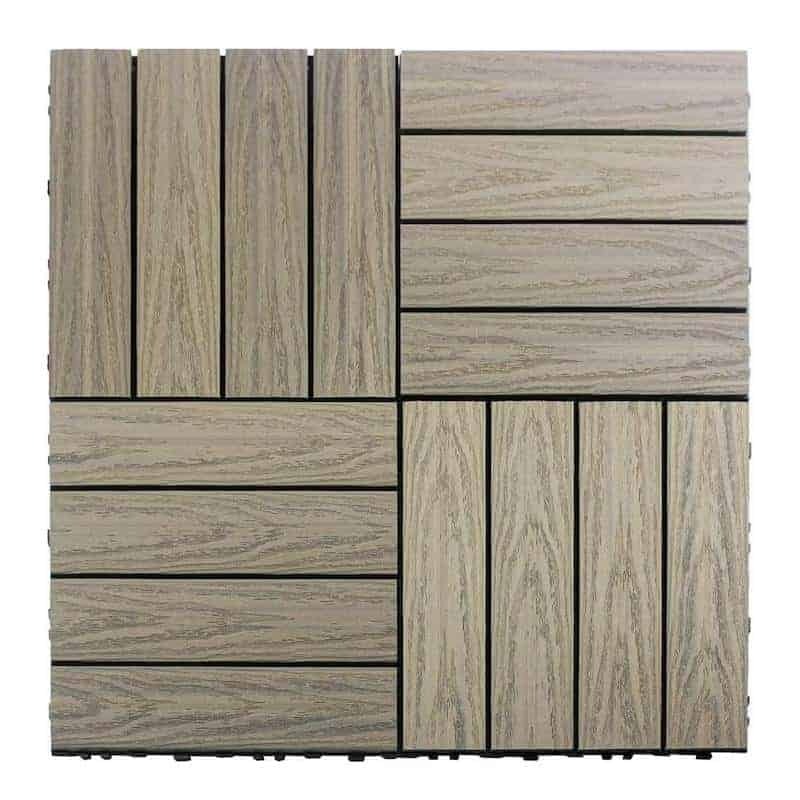 The Bare Decor tile, above, has nine slats per foot, while these tiles have four slats per foot or eight slats per two foot wide tile. Naturesort Slate Composite Tiles – These 12″x12″ tiles are made from bamboo and a plastic composite. Tiles are available in a few different configurations: a four slat (all slats run in the same direction), a six slat parquet, and an eight slat parquet. Sold in boxes of eleven, these tiles cover 11 square feet. I like the color and that it looks like brick pavers. NewTechWood’s UltraShield Naturale – This product offers the most design options. Made from recycled wood and plastic, the tiles are available in fifteen different colors. Everything from natural wood shades, to Caribbean blue, to Irish Green and Swedish Red. Not only do you have a ton of color options, but the tiles come in various sizes: 12″x12″, 12″x24″ and 12″x36″. One box contains ten tiles, and each tile has four wide slats. Coverage depends on the tile size – longer tiles cover more square feet. I really like that this is a system, and that you can get end trim pieces and beveled transition strips (so you don’t trip). Once you select a decking tile, you can get really creative. The tiles that are just simple slats (not in a parquet pattern) offer the most design options. You can place them end to end so they look like continuous slats. Or, you can alternate the direction of each tile, so they make a parquet pattern – like the NewTechWood image above. Another option is to make a bigger parquet pattern by using four tiles to make a unit in one direction and four tiles going 90 degrees the other way. You could also make a checkerboard pattern using two different colored tiles. A third option, would be to place darker tiles around the perimeter and use the lighter ones as the field. You could also use one shade of tile to make an accent area – like a rug – and another shade for the rest. Finally, you can combine the deck tiles with stones to make some really interesting designs. If your balcony measurement is not a multiple of your tiles, you can use a border of stones to fill in the difference. If the balcony floor is in relatively good condition, and you just want to add some flair, then paint it. If you’re feeling really adventurous and like to DIY, then stencil it. This Penelope Tile Stencil would look amazing. Just be sure to use a good sealer so you can enjoy your hard work for a long time. Outdoor area rugs are the easiest way to improve the flooring of a balcony. A rug can hide an ugly floor, or can “really tie the room together”, as The Dude says. I found these seven Safavieh outdoor rugs from Amazon that would look great on a balcony. The variety of designs is pretty amazing – from traditional (#3) to the modern deconstructed flower (#1) to Boho (#7). I really like all of these, but I think the mandala (#2) is my favorite. 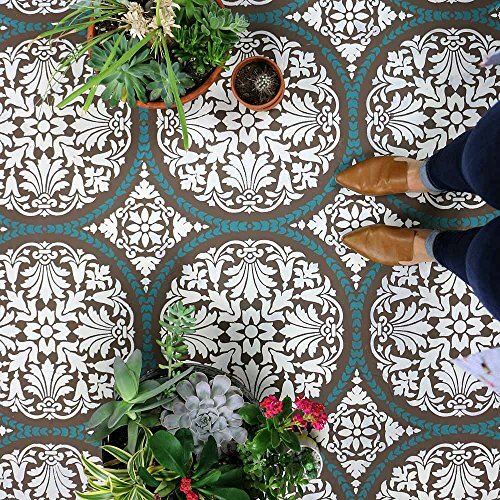 Whether you put down decking tiles, a rug, or DIY a stenciled floor, you don’t have to live with ugly balcony flooring. 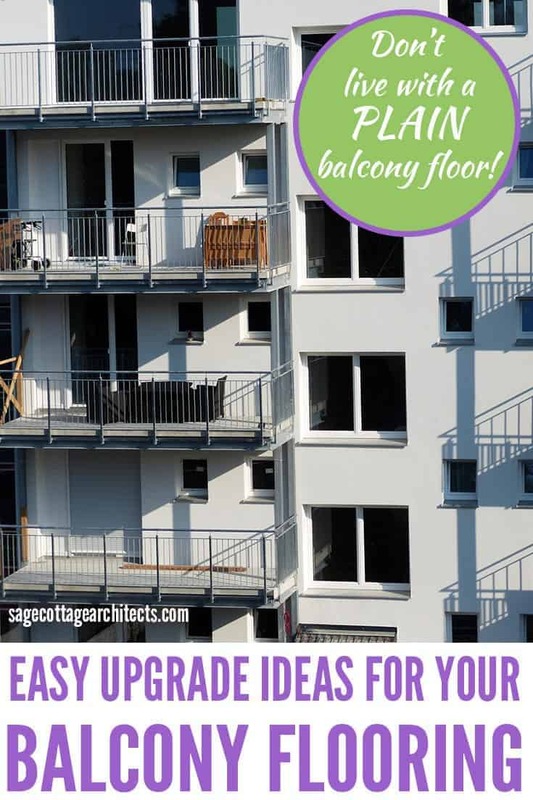 Start with a nice floor, and create a beautiful balcony that you can enjoy.